5F-ADB is a powerful indazole-type cannabinoid that is a very close analogue to the indazole-3-carboxamide family of synthetic cannabis products. 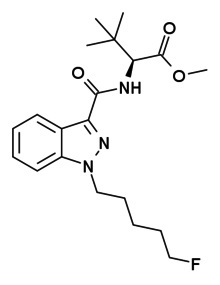 It is also known as 5F-MBMB-PINACA and Methyl (S)-2-[1-(5-fluoropentyl)-1H-indazole-3-carboxamido]-3,3-dimethylbutanoate. Its chemical formula is C20H28FN3O3. 5F-ADB is a potent agonist of the CB1 receptor, though it is unclear whether it is selective for this target. 5F-ADB was first identified in November 2014 from post-mortem samples taken from an individual who had died after using a product containing this substance. Subsequent testing identified 5F-ADB to have been present in a total of ten people who had died from unexplained drug overdoses in Japan between September 2014 and December 2014, and it was added to the Japanese banned drug list in December 2014. 5F-ADB is believed to be extremely potent based on the very low levels detected in tissue samples, and appears to be significantly more toxic than earlier synthetic cannabinoid drugs that had previously been sold. Pharmacology: Whilst it has not yet been formally tested, 5F-ADB appears to be an extremely powerful CB1 agonist, though its selectivity (or lack thereof) is unknown. It seems to be both extremely potent and somewhat toxic at high concentrations, so researchers are urged to use caution.